In this Monday, July 23, 2018, image from video provided by Elia Kallia, people escaping wildfires wade into the waters of the "Silver Coast" beach in Mati, Greece. 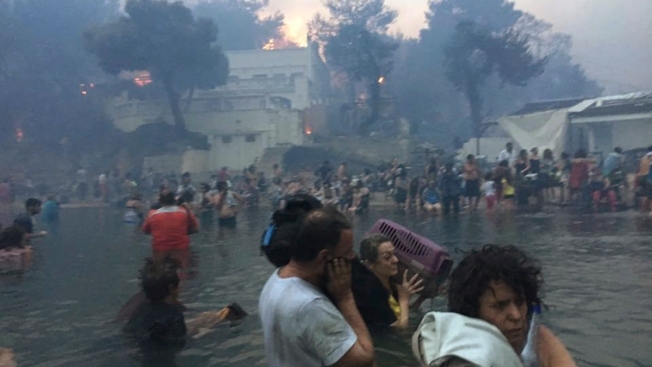 Dozens were either killed by flames or drowned as they tried to flee the fire into the nearby sea, waiting for hours in the water for rescue from local fishermen and other boat owners. Fire officials in Greece raised the death toll from a wildfire that raged through a coastal area east of Athens to 91 and reported that 25 people were missing Sunday, six days after Europe's deadliest forest fire in more than a century.